Today Gus came with me for an outing to the hairdresser’s. I love going to Uta’s because she’s local, she does a great job cutting my hair, she’s always full of fascinating information, and she’s a dog person, so I get to bring Gus along. I always call first, to make sure there isn’t a client there who’s afraid of big dogs, and usually it’s not a problem. It’s good for Gus to get out to see new and different places, and now that I’ve trained him to not eat the hair cuttings off the floor anymore, it’s all good! Today when we arrived, Uta’s dog Fluffy was waiting at the door. As any normal dog would do, Fluffy began to bark when Gus and I approached. The two dogs greeted each other with all the usual sniffing, and I sat down to have my hair washed. Now you can see from the photo above that Fluffy is significantly smaller than Gus. According to Uta, he basically just isn’t that fond of large dogs. I don’t know, maybe he views himself as the official greeter of the salon, and he resented the presence of this rather large slobbery dog who was busy saying hi to the other client in the room. Whatever the reason, Fluffy wasn’t too impressed with Gus, and he let him know it by barking quite a lot. After several stern comments and requests to be quiet, Fluffy was rather unceremoniously removed from the salon. He continued to bark from another room. Uta and I then resorted to bribery. We brought Fluffy back in and I gave the two dogs some tasty treats together – the hope was that Fluffy would think that the treat was from Gus, and change his point of view. No such luck. He just wasn’t impressed, and he wasn’t about to let this big dog hang out in his space without letting him know it. Eventually, after deciding that he’d made his point, Fluffy finally calmed down, and the two dogs settled into a somewhat peaceful co-existence while Uta finished up my hair. Before I left, we tried to get the two guys to sit nicely beside each other for a picture, and you can see the hilarious result above. I think the uncomfortable expression on Gus’s face, and Fluffy’s “I’m ignoring you” look say it all. Let’s face it, there are lots of dogs and lots of people in this world of ours. Just because we throw two individuals together, we can’t expect that they will automatically become best friends simply because we think it’s a good idea. I’m reminded of when my kids were little and I’d arrange “play dates” for them. If I met another new mom and we’d really hit it off, we’d try and get our kids together as well. Often this would turn out great, but sometimes it just didn’t work out. I truly believe that there is a sort of chemistry that exists between certain people and between dogs as well. It’s easy to see when a natural, comfortable friendship is developing, and it’s just as easy to tell when things simply don’t jive – like today. The natural inclination is to feel embarrassed and awkward when people (or dogs) we think should hit it off just aren’t interested in each other. But really, what’s the big deal? We can’t take it personally if they just don’t have as much in common as we think they should. As long as there are no hard feelings and everyone is amicable, it’s okay to have new acquaintances who don’t turn out to be lifelong friends. I learned a long time ago not to meddle in my kids’ friendships. They are excellent judges of who they relate best to, and they have all done fine choosing their own social circles without my help. Likewise, I don’t get hung up worrying that all of my different friends are friends with each other as well. I am lucky to have a diverse group of special people in my life, and they come from many different realms. Each one is unique and dear to me, but I don’t usually bring them all together and expect them to hang out as a big social group. They are just different people. 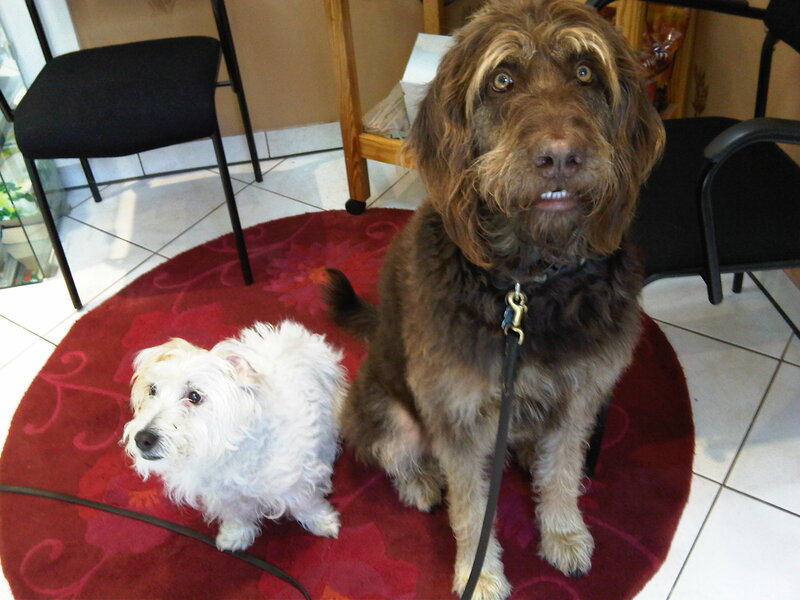 As for Gus and Fluffy; well, I do plan to bring Gus along again the next time I go for a haircut. Maybe they’ll get along better in five weeks, or maybe they won’t. I’ts all ok with me.